SHAFAQNA | By Leila Yazdani : Ayatollah Seyyed Ali Khamenei wrote two letters to the Western youth that circulated rapidly in the social networks. In the first letter he tried to elaborate on the reasons behind the West’s effort to spread Islamophobia. 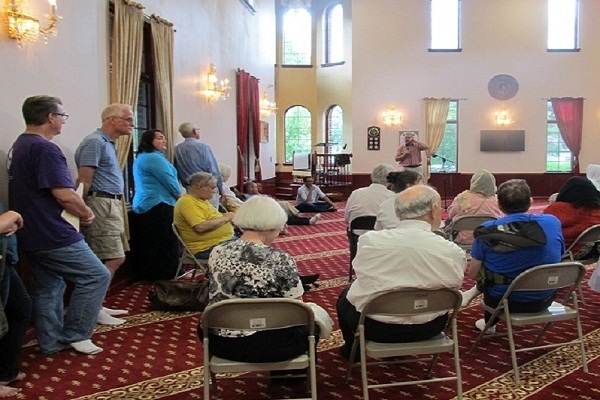 In second letter he tried to acquaint the Western youth with facts about those behind the formation of terrorist groups in the Middle East region that have committed heinous crimes under the name of Islam. Four years ago, in the aftermath of the terrorist events in Paris, massive protests and anti-Islam rallies spread across France and some European countries. The supreme leader of the Islamic Republic of Iran, Ayatollah Seyyed Ali Khamenei, talked to the young people of Europe and North America directly on January 21, 2015. He has written an open letter to Western youth urging them to examine Islam for themselves, rather than accepting the prejudiced views of the media and politicians. This letter published online and shared over Twitter. The first letter was written when western governments and media found the golden opportunity to foment mudslinging against Muslims in a broad magnitude. This provided western regimes to justify and intensify their criminal policies in Islamic countries under the guise of fighting terrorism. They tried to introduce Islam as a violent religion. This wave of hatred towards Islam caused the motive for the Leader of the Islamic Revolution, Ayatollah Khamenei, to write his second letter to the western youths 10 months after writing the first one on November 29, 2015. In his first letter, the Leader, addressing the youth of Europe and North America, asked them to get a direct cognizance of Islam regardless of widespread blackening against Islam. “Why does the power structure in the world want Islamic thought to be marginalized and remain latent?” he urges young people to ask. “What concepts and values in Islam disturb the programs of the super powers and what interests are safeguarded in the shadow of distorting the image of Islam?” Answering his own question, Ayatollah Khamenei says Muslims are just the latest in a long series of “others” that Western countries have scapegoated to justify oppression and profiteering, according to Foreign Policy. 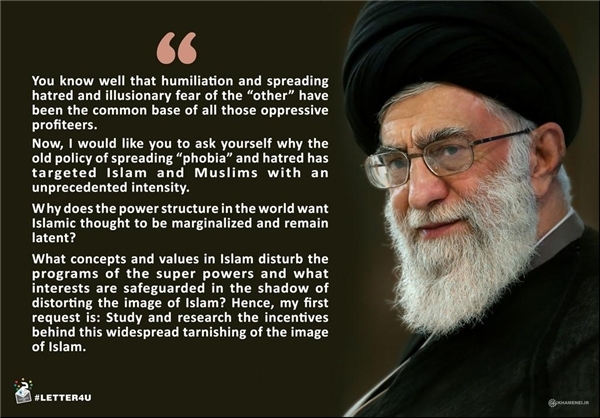 Ayatollah Khamenei wrote that over the past few decades, almost since the breakup of the Soviet Union, attempts have been made by influential people in the West to create a “horrifying enemy” out of Islam, Tr mentioned. The letter points to the major problems besetting the western societies and the way of exit from these problems. 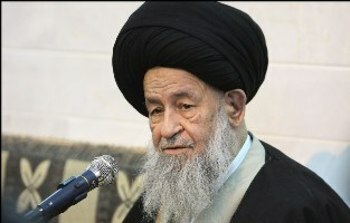 In his second letter, Ayatollah Khamenei stressed that the bitter events caused by blind terrorism had made him speak with the western youth once more. First, Ayatollah Khamenei doesn’t insist that any reading of Islam, including his own, should be accepted as the right one but rather in today’s world resentment and prejudices should be avoided. Second, In his first letter, he made it clear that he does not expect anyone to simply believe him about what Islam is and isn’t, encouraging all to study Islam directly and independently through the Quran and Hadith. Third, In this letter, Ayatollah Khamenei does not speak to sell the Islamic Republic of Iran to the world. 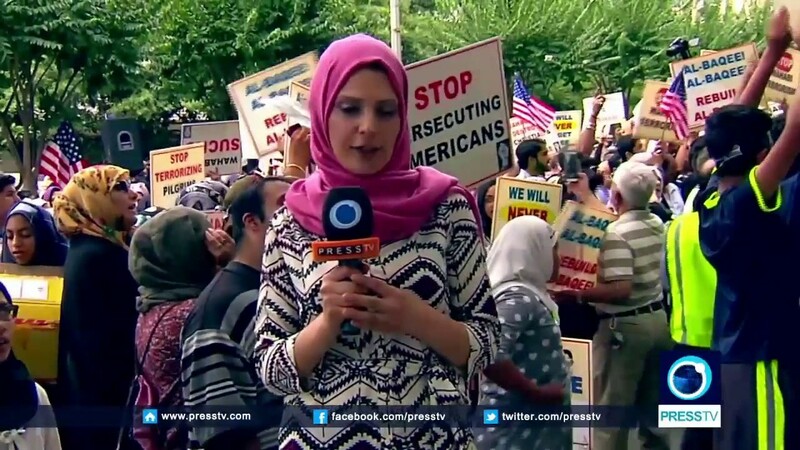 This is not pro-Iran propaganda, but is a Muslim leader speaking his mind. Fourth, the goal is much beyond any propaganda. First, The Leader’s second letter to the western youth reminded the important point that terrorism is the common pain of the Islamic world and the west. It was mentioned in the letter that although terrorists had caused the events of Paris, the same groups had been created and strengthened by western powers, especially the United States. As the Leader of the Islamic Revolution says, today it has become clear to all which countries played the pivotal role in formation and strengthening of terrorist currents and organizations like Al-Qaeda, Taliban, Daesh, al-Nusra and scores of other terrorist outfits. Without the support of the US, UK, Saudi, UAE and a few criminal regimes, Takfiri currents would never be able to turn into the biggest terrorist groups in the world. 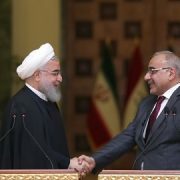 This sentence indicates the fact that the leader of a country, whose people have lost more than 17000 of their innocent people in the western-backed blind terrorism, is upset with such incidents even if they take place in a country whose statesmen have been the main supporters of terrorists in Iran. No doubt, such a view is originated in the profound divine vision which attaches high respect for the lives of humans regardless of their race, nationality, geography and so on. 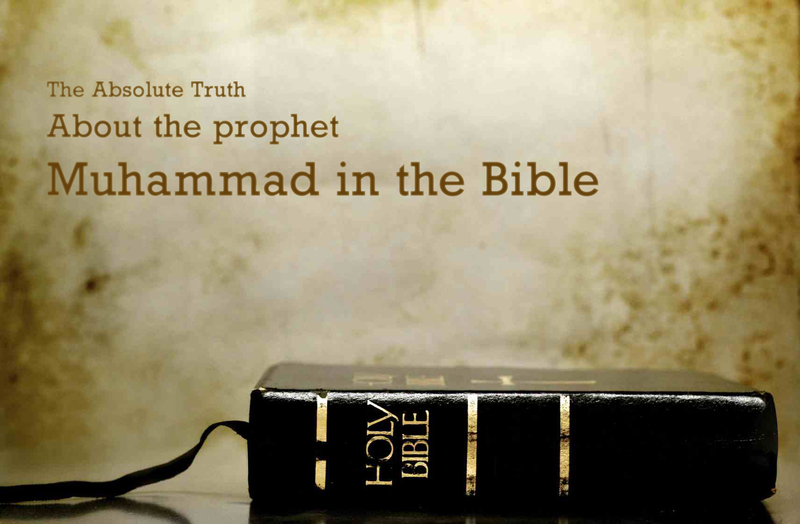 The Prophet of Islam was given the divine mission as the final messenger to salvage mankind from ignorance and blind bigotries and lead them toward divine values. How can such a religion advocate murder and crime? Contrary to the western regimes, which deem humane values as relative, in Islam moral and humane values are absolute and respected all the time. The events of recent days and months in Yemen and the murder of an Arabian critic by the Saudi regime and the reaction of western regimes, especially the US, to these incidents clearly show how humane values are slaughtered before billions of petrodollars. The crimes of Israelis in the Occupied Palestine and the all-out support of the American regime and many of the western regimes for these crimes are a live document of these regimes’ black and bleak record in violation of humane and moral values. Second issue highlighted in Ayatollah Khamenei’s letter to the western youth was the difference of terrorist incidents in European cities and such incidents in Islamic countries. 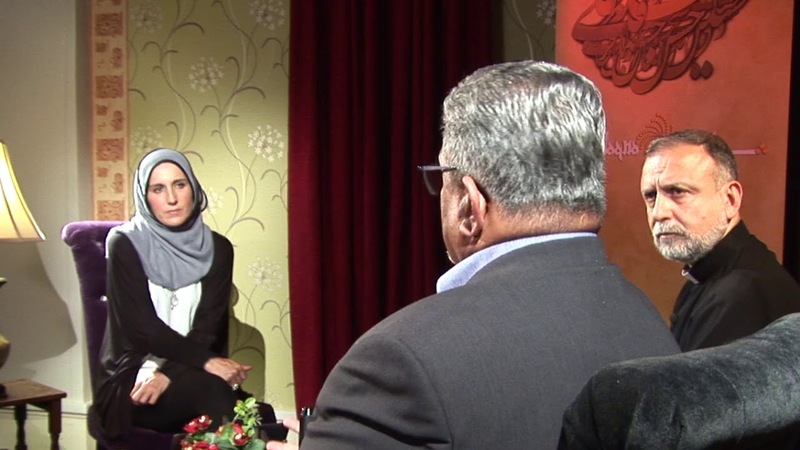 He wrote, “It is necessary for you to know that the insecurity and anxiety that you felt in the recent incidents differ on two major grounds with the pain that people in Iraq, Yemen, Syria and Afghanistan have endured throughout successive years”, Parstoday told. Third, the Leader referred to the contradictory policies of the west vis-à-vis the Islamic Awakening. Fourth, The letter, a condemnation of terrorism, can also be seen as a plea for self-reflection and clarification of misreported facts at a time of heightened tensions, bloodshed, war, occupation, hate. Fifth, in the twilight zone where many Islamophobes live, Muslim leaders never speak out enough against the senseless killing of Western innocents. Ayatollah Khamenei have always spoken out against terrorism and oppression of all sorts against all people regardless of age, race, faith, by any manner. Sixth, if it is Western policies which have provided fodder for terrorists to grow, then that must be pointed out unapologetically. There need not to be censorship of the truth. The second letter, as well as the previous signified a dialogue needs to occur. Ayatollah Khamenei is stretching his hands out for such a conversation, but is anyone on the other side willing to respond in kind?, till the dialogue occur.